I’ve had Kansas City on my mind today. 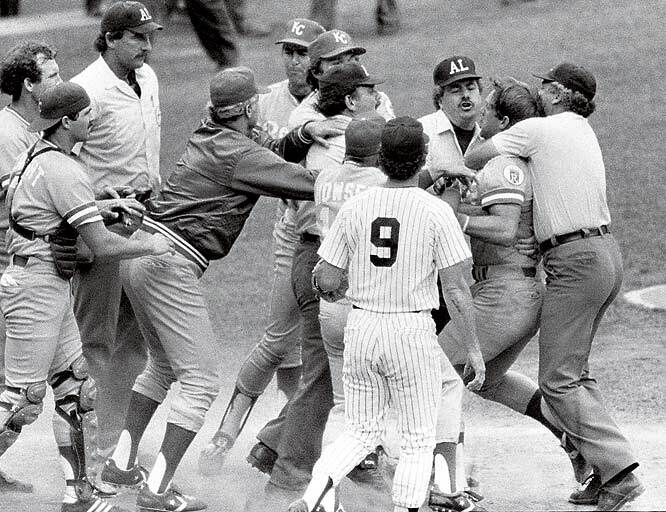 On this date back in 1983, George Brett and his infamous pine-tar incident brought disgrace to the city and baseball. Or maybe it didn’t. I guess it depends who you root for. The Royals were playing the Yankees in New York. It was the top of the ninth with two outs. Royal George Brett comes up to bat and hits a two-run homer. The score is now 5-4. The Yankees manager, Billy Martin, noticed that Brett’s bat had pine tar on it about 6 inches further than the rules allow. For you non-baseball fans out there, a) shame on you, and b) pine tar makes the bat easier to grip. The game was called in the Yankees favor. There was a massive protest from George Brett and the Royals and controversy for weeks about whether or not the home run should have counted. Eventually the game resumed on August 18th. The Royals won. But the tarnish remained. Even though I think George Brett was an amazing baseball player, I still think of the pine tar incident first. And when I think of Kansas City, that’s what I think of first as well. I’ve never been to Kansas. Nor Missouri. So I obviously haven’t been to either Kansas City. But I’m dying to go. Naturally not because I want to see honest baseball players. No, I want to go mainly because I can’t, for the life of me, comprehend why it’s figured so strongly in American music mythology. My friend who grew up in Missouri describes it as a ‘modern-day cow city.’ And my friend who grew up in Kansas merely said, ‘it’s not a very big place.’ Hmmm. But in the mid-20th Century at least, it must have been a destination. There are about five million songs about Kansas City and probably two-thirds of them talk about K.C. women. And I’m not just talking about the most well-known Kansas City song. We’ll get to that momentarily. There are tons of blues songs and lots of jazz songs that are all named after or are about Kansas City. When I read about it, though, the most interesting thing I’ve found is that the Missouri side has more fountains than any city in the world except for Rome. And this disconnect between reigning supreme in pop culture and being a big ‘meh’ in life is why I want to visit so badly. I’m sure that when I do get there, I will discover the secrets of the town and have learn all about its steamy underbelly just like all the songwriters must have. “Kansas City,” the song you’re probably thinking of, has a pretty interesting story behind it. Leiber and Stoller wrote it in 1952, way before they were huge successes. They were only 19 – and they hadn’t been to Kansas City either. They were from L.A. They had West Coast rhythm and blues artist Little Willie Littlejohn record it. Federal Records, who released the track, had it renamed “K.C. Lovin’” because it sounded cooler. It didn’t chart, but I think it’s still the best version out there. Seven years later, Wilbert Harrison recorded his version in New York, changing one of the lines to the now-famous “they got some crazy little women there, and I’m gonna get me one” and reverting back to the song’s original title, “Kansas City.” This version made it to #1, but there were not 1, not 2, not 3, not 4, but 5 other versions of the song in market at the exact same time. Ah, for the days of the Wild West of the music biz…. Can you imagine that happening now? I love crazy stuff like that. Sadly I just learned that 12th Street and Vine doesn’t exist anymore, which means one less instagram post to make if I do finally make it there one day. But rest assured, I’m sure I’ll be posting a lot of pix of fountains. Maybe I’ll even put some pine tar on one.